To bridge the sciences and humanities, LBC provides students with a strong foundation in the sciences and mathematics within their historical, philosophical, and social contexts. LBC students take a sequence of courses in the History, Philosophy, and Sociology of Science (HPS), which teach them to think critically about the societal environment in which science is done and the impact that science has upon society. 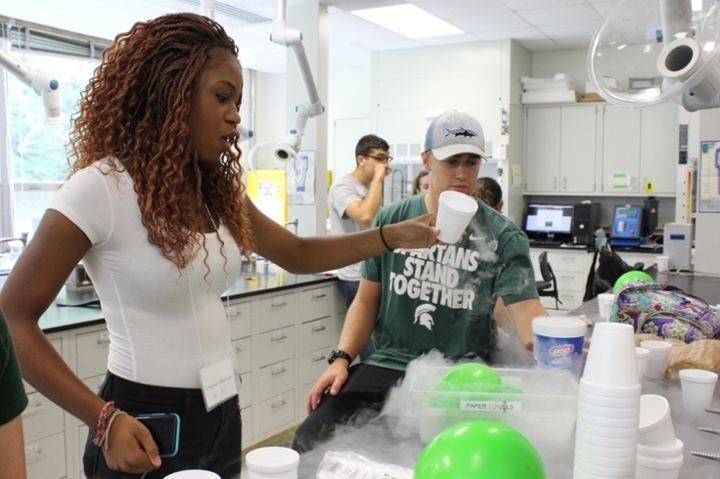 LBC provides a community where students can explore the sciences with the support and mentorship of their peers, faculty, and advisors. We embrace learning environments that celebrate different beliefs, practices, and backgrounds. Dhaval is a sophomore from Canton, Michigan majoring in studying Neuroscience and History, Philosophy & Sociology of Science. He is a Resident Assistant, a Research Assistant, a Tower Guard Executive Board Member, and a Briggs Ambassadors Executive Board Member. Briana is a senior from Lansing, Michigan majoring in Human Biology with a Global Public Health and Epidemiology Minor. Briana has studied abroad in Paris, and has volunteered abroad to help improve health and economic outcomes in low-resourced countries. Qadir is a junior from Troy, Michigan majoring in Zoology. He traveled to Kenya to study Behavioral Ecology in African mammals, and hopes to work with Exotic Animals as a veterinarian.